It is Thursday. It is the day for Travel tales on Thursday and it is 21st day of A to Z and the letter today is U.
I sat with an Atlas thinking of a place to review, but in the end could think of nothing better than reviewing my own birth place. If Madhya Pradesh is “Hindustan ka dil” Uttar Pradesh is the eyesight of the country. They say eyes are mirror to your soul. So is Uttar Pradesh. Although I have often wondered why, but the two great Indian epics are set in UP. Krishna and Rama were born here; Budha chose to breathe his last. The divine ghats of Varanasi are here, the three holy rivers meet here. The legendary beauty of Taj Mahal is also here. Fourth largest state in India, it is the biggest constituency in Lok Sabha. It is a highly populated state with quite a diverse culture. A mix of two most dominant religions in India, it also has the highest number of immigrants because of the borders with Nepal. Having travelled across the state, I believe that the power of tourism in this state is really understated. People seeking love (Taj), salvation and meaning of Hinduism (Varanasi and Allahabad) tracing Buddhism (Kushinagar) culture and heritage (Lucknow) mythological history (Mathura, Ayodhya) or expedition (en route to Nepal) travel to Uttar Pradesh every year. It is fairly easy to travel across the state. The roads are not bad and there are several trains that connect the state with Delhi. Also, there are airports at all major cities. One can always find a decent hotel to stay at. However, the road transport services and government services aren’t great. The best time to visit – Sep – Nov, Feb – Apr. It gets too hot or too cold in summer and winter seasons. Since the power cuts are huge, one might want to consider visiting in these times. Some part of Uttar Pradesh is highly popular tourist destination, some aren’t. But all in all it is a good place for a trip that could leave you with a bag full of memories. In order to introduce TED, I can only say that if you haven’t heard about it already please go check it as soon as you are done reading this post. TED stands for Technology Entertainment Design. It is set of conferences on the three main areas around the globe. The philosophy of TED is simple. If there is a good idea, it needs to be spread. Owned by a non-profit group, TED has had achievers from all over the world talk about their unique ideas. Be it science or design, TED talks are designed to bring the best of the knowledge. There are several sub groups of TED – like TEDx or TED fellows. Some of the popular TED talks are by Bill Clinton, Malcolm Gladwell, Steve Jobs, Bill Gates, etc. My favorite talks from TED are by Elizabeth Gilbert, Amy Tan, Hillary Clinton and a few others. The best part about TED talks are that they come in high quality and free. TED is available in form of an App therefore, it is available on phone. It is advertisements free and also available on Youtube. Here we are! With another guest post for my little blog. This time I have got a movie review from Kajal Kapur. 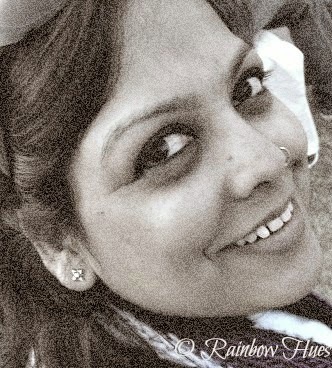 I first got to know Kajal when she did a story for Ultimate Blog Challenge. While I was writing (read struggling and failing) a story too, she did a wonderful story with right surprises and perfect end. I have been a regular visitor to her blog Rainbow hues since then. A few weeks ago I saw that her blog wasn't doing A to Z and requested her to be a guest blogger, and I got to know that she was doing the challenge through her other blog Movie Masala. There are romantic movies and there are comedies and then there are some movies that fall in both these categories and yet stand on their own. This one, for sure (for me) falls in that category. I fell in love…and then I fell in love with this movie. And this stays as one of my all time favorite movies. In spite of how clichéd this movie seems, it is very close to my heart and shall stay for a very long time, I believe. Melanie Smooter (Reese Witherspoon) and Jake Perry (Josh Lucas) are childhood sweethearts and are married but Melanie takes off to New York City to fulfill her dream of becoming a fashion designer. She changes her last name to Carmichael and also gets engaged to the mayor’s son Andrew (Patrick Dempsey) and does not tell him that she is still married to Jake back home. She takes off to meet her parents with the intention of finally getting a divorce from Jake back in Alabama, which he has been evading since the last seven years. Jake refuses to sign the papers and suggests her to spend some time with her parents. Melanie spends some time with her family and friends and feels that she has only moved away from the place physically but her heart still connects with the local people and her old friends. She begins to understand how well she is still rooted to her hometown. In the mean time, the mayor Kate Hennings (Candice Bergen) sends her assistant to check the family background of Melanie. While Melanie is at her friend Bobby Ray’s place, where she had gone to apologize for her misbehavior with him, the mayor’s assistant discovers her. She lies to him that the plantation belongs to her family. Simultaneously Jake, upset with her behavior with their mutual friends, signs the divorce papers for her. Melanie learns from a friend that Jake had once gone to New York to meet her because he was still in love with her. She finds her heart melting and confesses this to her dead dog when she goes to the cemetery. Jake and Melanie chat for a while and Melanie on realizing that she still loves Jake and tries to kiss him. Andrew also follows Melanie to her town and discovers that she is already married to Jake. Melanie’s father explains the situation to Andrew and he agrees to get married to her in Alabama. On the day of her wedding, Melanie realizes that she cannot marry Andrew since she still loves Jake and follows her to the same beach where they used to play as kids and had promised to be married to each other. Jake and Melanie finally kiss and make up. Melanie: You're the first boy I ever kissed, Jake, and I want you to be the last. Jake: Since when does it have to be one or the other? You can have roots and wings, Mel. Jake: Nobody finds their soul mate when they're ten. I mean, where's the fun in that, right? Melanie: And don't even pretend like you missed me. Stella: You know for someone whose been holding onto something for so long, you're pretty quick to let it go. Jake: I can't control her, any more than I can control the weather. Melanie: ...It's funny how they do. Jake: C'mon, I wanna show you something. Jake: The girl I knew used to be fearless. Melanie: The girl you knew didn't have a life. Jake: Guess you better get on with it then. With this post we come to completion of two-third of A to Z challenge. When I took up Reviews A to Z, I didn’t know what I will review. I had a title for Z and for couple of other letters. In fact, on 31st of March, I sat clueless about the topic for A. My brother came to my rescue and did the first post. From that point on, I have only been discussing the A to Z challenge with friends, family and colleagues. Therefore, today I decided to do a quick review of my performance in A to Z challenge. ¾ Well! It is not my first one month challenge. But it was toughest, since we were restricted by letters. ¾ However, this was one challenge where I well planned. I write every now and then and schedule. ¾ In terms of audience, I have received a versatile and highest number of audiences in this challenge. ¾ As a reader, I have begun to follow twelve new blogs and have read twenty posts a day on an average. ¾ I came across a few comments, which told me that my review helped them discover something great, which means my reviews weren’t a complete waste. ¾ And highlight of the month, I have had some wonderful bloggers doing a guest blog for my challenge this month. My first post for the challenge was done by my brother to Review Apps that he loves. However, there is one that he missed, and it is our new found addiction. It was a few weeks ago that I downloaded one of the fastest growing games on my phone. As name suggests, it is a quiz game. You can play against a random opponent or challenge a friend. I guess the best part of this quiz game is that there is a variety of topic. From Geography, to history, brand power, to music and movies… it offers something for all interests. It is simple to handle and easy to load. Most importantly it is knowledge along with fun. My favorites are grammar and brand facts. Have you tried Quiz up yet? As I write today’s post, my mind tells me I am hungry (actually I have had food just about half an hour ago) and I think hard to think of something spicy, tangy, tasty to eat. But in fact what I crave for is the paranthas from Paranthe wali Gali. If you are in Delhi and you haven’t been to this lane in old Delhi which is famous for Paranthas, please make a resolution to go there this weekend. Even I had not been to Paranthe wali gali for a long time during my stay in Delhi. Then while ticking my to-do list from LP (read my experience with Lonely Planet here) I realized I had HAD to go to this place. 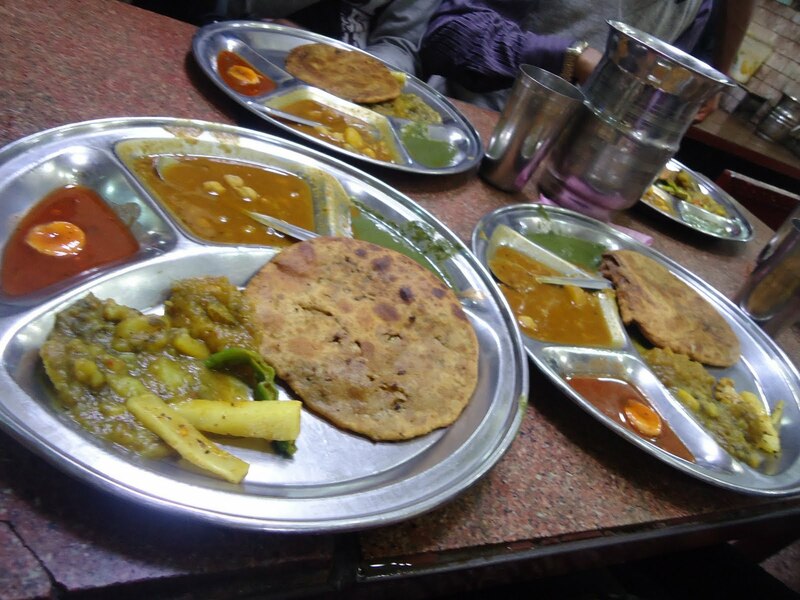 A walking distance from Chandni Chowk metro station, Paranthe wali Gali is a crowded lane adjacent to the famous kinari bazaar. The lane has several small restaurants selling deep fried paranthas. Yes you heard read my correct! The paranthas are deep fried. Take a deep breath my friends. It is not as bad as it sounds. Although, deep friend, these paranthas are not as oily as you imagine. There is another surprise waiting for you here. Forget about conventional potato and onion filling, this letting sets out to leave a memory with their unconventional fillings of jaggery, sugar or chili. The whole experience of eating in this small lane could be overwhelming and the chaos in queues and heat around you could leave you in perspiration. But don’t worry, drown it with a glass of Lassi and enjoy the frenzied excitement of the lane. 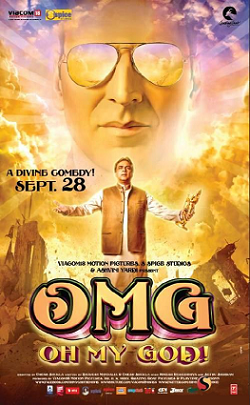 Review A to Z – Oh My God! Oh My God! is one of those rare movies which I hear being mentioned every now and then even after two years of release. I was supposed to review a place today, but I made a last moment change in plan and chose to write about this movie as I heard two people speak about how it changed their perspective. 1. My mother called me on eight day of navratra and we were discussing what should I cook for kanya pujan. She agreed that there is no point in cooking halva and rather I should give some fruits and nutritious biscuits to these girls. A change in opinion I see. Credit – to a thought provoked by the movie. 2. A colleague narrated how he no longer offers milk packet to lord Shiva every Monday. He rather offers a fraction of that milk to the God and gives rest to a poor guy near his house. Credit – a revelation on wastage of milk shown in the movie. I rarely watch movies and I consider myself as bad movie reviewer. Therefore, I avoid pondering over the message that movie provided and review until it is absolutely necessary. However, Oh My God! is not just a movie. It is a small revolution, a message to all. It is not just entertainment, it is thought provoking. Moreover, it is balanced. Paresh Rawal is a wonderful actor and he has done complete justice to the role of Kanjiram. The bit on Krishna was a bit hilarious but it added life to the movie. Dialogue and script of the movie are powerful and leave a long lasting impression. But if you are thinking it is a comment on religion, you are mistaken. It is not a question on existence of God or comment of any religious belief. It evaluates each religion in a neutral light and only questions the elaborate practices that take place in name of religion. It isn’t easy to make a movie that is balanced to all religion, but even being a Hindu, I didn’t feel it was anti Hindu and one has to admit that it displayed truth and nothing else. As a three hour movie for which I shelled out a good portion of my entertainment budget, it is a paisa vasool. It is a remake of Man who Sued the God but I haven't seen it. Have you seen either of the two movies? What is your opinion? Here I introduce you to my guest author for the day. 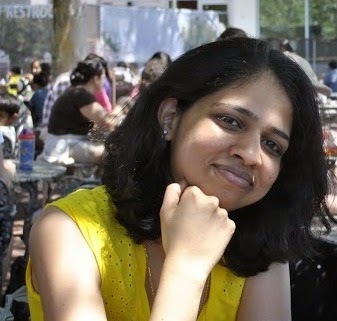 Seeta Bodke is a Bangalore based blogger, whom I met on a blogging community. She is an avid reader, appreciative of good work and quietly churns out amazing posts at her blog called "The Write Side". I requested her to do a guest post for my blog and she sweetly agreed to do a book review for letter N. So ladies and Gentlemen, without taking much time of yours, I present to you rest of the review of Never Let Me Go by Seeta Bodke. Never Let Me Go is probably one of the finest of his works. While Remains of the Day continues to remain my personal favourite, this particular piece of work touches a chord in an entirely different way. Kathy a ‘Carer’ for ‘Donors’ reminisces her childhood and her days at Hailsham School, esp. the friendship she shares with fellow students Tommy and Ruth. As she rummages through her chest of memories, you realize that Kathy and her friends have always been different from ‘normal’ people. They are taught by teachers called ‘Guardians’ who focus more on Arts and Humanities rather than the usual Mathematics and Science one would expect in school. As they grow up, one of the ‘Guardians’ Ms. Lucy tells them they are not ‘normal’ and cannot have babies like ‘normal’ people can. She also lets out that they are meant to be carers and then donors when they grow up, ‘completing’ their life while doing those donations. Despite the fate that has already been decided for them, Kathy and her friends lead a peaceful life completely oblivious to what the real world is really like. For them, the life that is set out for them is what is ‘normal’ and it is what they live for. Her friendship with Tommy is one with a depth of emotion and attachment which does not result into a relationship of love. Not until much later, when Ruth confesses to have let her jealousies keep them apart. All this; despite the knowledge of how short their lives really are. As Kathy took me down her memory lane, it made me realize how uncertain life actually is and how despite all odds, we learn to live with what we have. Kazuo Ishiguro as always does a brilliant job of presenting the past, esp. of portraying incidents across time while efortlessly moving forward and back to tie them all together. The vivid descriptions he gives to each of Kathy’s memories makes you feel as if you have lived all of them along with Kathy and her friends. Certain incidents stand out for e.g. the absence of a imagery description of Norfolk makes the students feel it is a long lost place in England where all long lost things could be found. When Kathy finds a copy of her lost music tape in a second hand shop in Norfolk, that story Ishiguro had built comes to life. Similarly his descriptions of the surroundings make you visualize places as if you have been there. Ishiguri weaves this sinister yet tragic tale of clone programs for organ donations entirely based on emotion without relying on scientific research for emphasis. His ability to portray the sentiments is what makes this book stand apart. ‘Never Let Me Go’ a song from the tape Kathy owns sums up this moving story of how cruel the world can be. While Kathy imagines an impossible dream of having a baby when she hears the lyrics “Never Let Me Go, Oh baby, baby never let me go”, when ‘Madame’ catches her holding a pillow and dancing to the music she sees it as a little girl tightly clinging on to her old kind world… one that she knew would not remain forever. 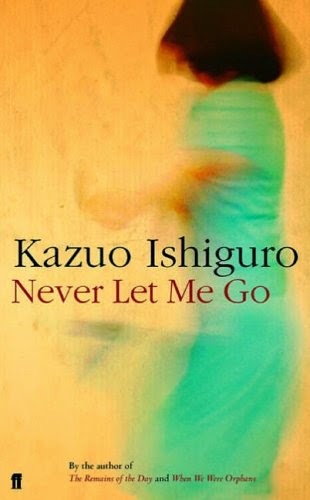 With Never Let Me Go, Ishiguro paints a distressing picture of how inhuman humanity can be. This book breaks your heart into tiny pieces and yet makes you marvel at the talent of this wonderful Author. While it might make you shed a tear, do pick this book for the love of the written word. Well! It is no secret that I am a marwadi. Also, it is not even close to a secret that my food habits are of typical north Indian. I have grown up eating Chapati and potato. I have learned to eat in thalis and serve all gravies in bowls. I rarely eat rice. Now put me in a place where all my meals contain rice (or its varieties), are served on leaves or foils and contain sambhar/rasam instead of Daal (which is not a usual practice as per my Tamil colleague). You would think I would hate it. Yes you are right, I had difficulty in most places except when I reached Murugan Idli in Chennai. After an eight day trip to interiors of Tamil Nadu, my first evening in Chennai I avoided all sights of any south Indian cuisine. But by next evening my colleague was craving for some good South Indian (yes! Even he couldn’t relish what we ate for last one week) and Murugan Idli came with high recommendation. As we walked down the Besant Nagar Church, we spotted the place that we were looking for. The restaurant is simple and clean. Maybe it was the time of the day, it was hardly crowded. We took our table and waited for menu. A simple small menu was presented to us and we ordered some idli, vada and my favorite masala vada along with fresh juice. The food arrived in minutes of ordering. Although, I wasn’t really hungry, a few bites told me that I hadn’t had an Idli this good ever in my life. By the time we finished the food we had ordered, I was full but I still craved for more. After eating another plate of Idli and a filter coffee, I insisted on getting a plate of Idli packed for next meal. The surprising part was as I saw the bill. For all that eating (read hogging) I paid just about Rs. 200. I later got to know that Murugan Idli Shop is a famous chain restaurant in Chennai and they have branches in Singapore too. My first experience with Murugan Idli was a fantastic and I insist on visiting there for a meal whenever I am in Chennai. All my friends who have been to Chennai, have you tried this place ever? 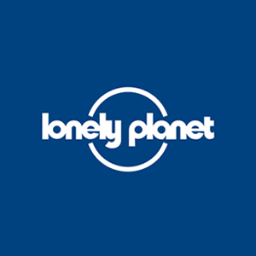 All you wonderful travelers out there, I know lonely planet needs no introduction. One of the World’s biggest travel guide book publishers, are spread all over the world. Whatever might be your destination, Lonely Planet provides us all the relevant information like how to reach, where to stay, sights to see, things to do, places to eat and tips on travel. Okay! This post is not about reviewing the world’s biggest travel guide, it is about reviewing the usefulness of world’s biggest travel guide to explore your own city. This was the time when I had first discovered the magic of lonelyplanet.com. I had returned from a recent trip and realized that by relying on LP to explore a city, I hadn’t made a mistake after all. On a particular day, I sat in office with a little free time and began to browse lonely planet Delhi guide. Having lived in Delhi for little less than nine years, I consider myself with a good knowledge of the city. I know most ways, all popular tourist destinations, people and their nature and can give an advice to even a Delhi-ite. But as I began to browse LP, I started to note places that I had either heard of or not, but never visited. With some reluctance, I made a list of places to visit and restaurants where to eat. Over next year, one by one I tried most of the places from the list and each time I came back with a response “God! How come I didn’t know about this place yet?” I shared my experience with other enthusiasts and the response I received was quite same. 2. The reviews are brief and exact. 3. The location and the other details are more or less accurate. My journe of exploring my city with Lonely planet has been completely fantastic. Have you tried lonely planet for your city yet? All the ladies out there - have you seen the latest advertisement of Special K by Kellogg’s? You see Deepika Padukone’s slim waistline as she clicks a selfie and your remember your own. Don’t you? Approaching the Golden thirty or the dreaded thirty (read my friend’s Richa’s posts here to know what I mean), our my metabolism is certainly not as great as it was when we I sported shorts and tees in college. Desperate moments call for Desperate measures. I decided to “Diet” (now, let me clarify that I am a self-acclaimed foodie) and my version of diet is something like this - If it is salad, I need cheese dressing and if it is soup I need cream in it. Fries, junk food, eating out, cheese and chocolates form my daily diet. To shift from these to something else without compromising on my taste buds was a challenge. There I was, exasperated and distressed when I bought a pack of special K. “Two bowls, two weeks and up to two inches lesser” “Hell yeah! Let us try” I told myself. My first bowl I noticed, that it wasn’t all that bad to taste. I mean, one-it is sweet. Therefore, even without adding sugar or consuming it in Cold milk wasn’t bad. For breakfast, I am usually inspired to eat something Healthy but for dinner (where the major challenge lies) it pretty much substitutes main course like an extended dessert. Well! This worked. There started my routine of eating a bowl of cornflakes and mix it with something or other for flavor. It is no longer a “diet”, it is alternate diet, and I look forward to it. My waistline, well that’s not to be discussed, I haven’t kept off sweets and savories for a single day. I think Special K is not for me because I can’t control the food I eat, but I guess that it is without doubt a tasty supplement if you plan to “diet”. Here comes my first book review of the challenge. 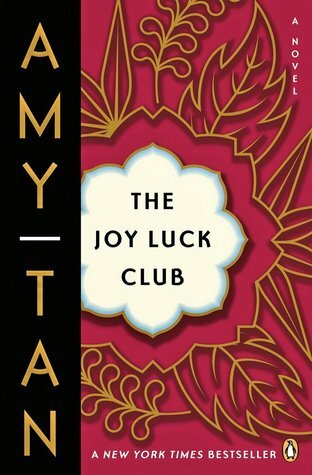 TheJoy Luck Club is a fiction by Amy Tan. I got this book to read as a part of our little book club that I am part of (some of you know about it already) and scheduled to read it during April. But as fate would have it, I ended up getting this book in March and immediately began reading it. Just about ten pages into the book I got a review that it was sort of boring. My expectations were low. However rules demanded that read it and I am super glad that I did. The Joy Luck Club is the story of four American daughters and their Chinese mothers who moved to USA during the war. The story moves from past to present, while mothers remembers China and daughter struggle to understand. It gives us insights to Chinese traditions, customs, families and culture in China and in USA. Each character in the book is well defined and seems to be the protagonist in its own ways. When the book ends, it leaves you with a sense of longing for more. It appears that the author has purposefully left the endings slightly open ended where life has not come to a full circle just yet. The word Amy Tan used are easy to mouth but the names are a bit too much to remember. It is a book that can be read and re-read and reveal something new when picked up for the third time. It is over many generations and many lives and yet so simplified and neatly arranged. I found myself going back and forth at times but I thoroughly enjoyed reading it. It is one of those books that I say “remains in you”. A 4.5 out of 5 for this book. P.S. – If you want to read it, I would love to share it. Also, I got to know while writing the post, that it is also a motion picture.